CrazyGadget® Seal Fresh Airtight Food Storage Tubs – 2 Sets of 4. · 2 Sets of 4: 500ml (10.9x16x5.5cm), 900ml (13.2x18.9x6.5cm), 1.5L (15.3x22x7.5cm) and 2.4L (18.3x25.2x8.5cm). Car Care and Accessories. All in good clean vintage condition , Comes with 2 scopes in green. They stand 21cm tall and are in used but very good condition. 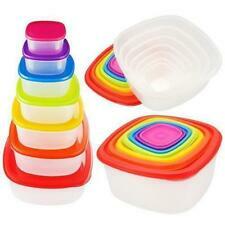 Ideal for the storage of cereals or flour or pasta etc. A little superficial nip in the plastic at the front next to the flower. Harvest Design. Round and Yellow in colour with an attractive star pattern on lid. Circa 1970's.